Town of Latchford (Single Tier Timiskaming)Record Owner? Log in. Pop. 306. 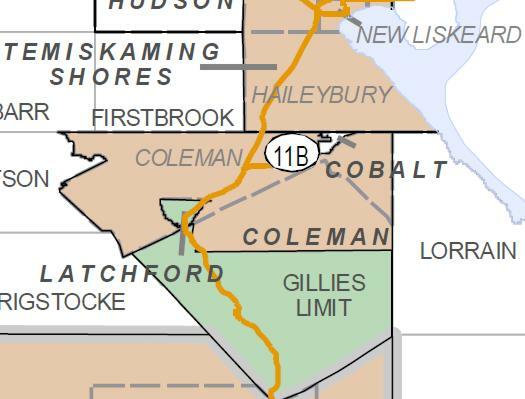 In Coleman T., Timiskaming Dist., on Bay L. and the Montreal R. and Hwy 11, 130 km NW of North Bay. The place was well known to First Nations Peoples and explorers because it was on the Montreal River system, but the frrst settlement of any kind was a Hudson's Bay Company trading post built on nearby Fiddler's I. in 1888. It burned down in 1905. No settlement developed until the arrival of the Timiskaming and Northern Ontario Railway. When the rail line was being built, silver was discovered in Cobalt, 14 km N. Latchford prospered on the heels of the great silver boom as the jumping-off place for prospectors headed north. By 1907 the population was over 1,000. Major fires in 1908, 1910, and 1911, the end of transient prospectors, and the First World War, dealt the community a series of blows from which it never economically recovered. The community was named after Hon. Francis R. Latchford, minister of works, who turned the first sod for the railway in North Bay in 1902 and drove the last spike at Moosonee 30 years later. By roofing a culvert over Latchford Cr., the town claims the World's Shortest Covered Bridge. It is 11 feet, 3 inches (3.4 m) long. Have something to say about Town of Latchford (Single Tier Timiskaming)?